The global market for agriculture robots is presently at a developing stage and is expected to rise at a rapid rate throughout the forecast period, states a new research report presented by Transparency Market Research. The growing demand for advanced agriculture equipment and the influx of several new players are the key factors that are predicted to support the market growth in the next few years. In addition to this, the rising expenditure by the leading players on the research and development activities are likely to create potential development opportunities, thus enhancing the overall growth of the market in the coming years. Some of the key players in the global agriculture robots market across the globe are SenseFly SA., Naio Technologies, Harvest Automation, Inc., Clearpath Robotics, and PrecisionHawk, Inc. The rising collaborations and strategic partnerships among the players are projected to support the growth of the global agriculture robots market in the next few years. In 2016, the global market for agriculture robots was worth US$1.01 bn and is projected to reach a value of US$5.7 bn by the end of 2024. The market is likely to exhibit a strong 24.10% CAGR between 2016 and 2024. With the presence of several leading players, the North America market for agriculture robots is anticipated to hold a major share of the market throughout the forecast period. In addition to this, the North America agriculture robots market is predicted to register a strong growth rate in the near future. The rise in the adoption of new technologies in the field of farming in order to enhance the production and profitability capabilities is considered as the major factor estimated to enhance the development of the global agriculture robots market in the next few years. The rising investment and support from government organization for the adoption of modern agriculture equipment is another aspect that is likely to accelerate the growth of the global market in the next few years. In addition to this, the rising demand for food, owing to the rising population around the world is estimated to support the market growth in the near future. Furthermore, in the last few years, the use of unmanned aerial vehicles for agriculture farms has increased to a certain extent, thus support the market growth in the near future. Moreover, the key players are likely to focus on emerging economies, which holds immense growth potential throughout the forecast period. The increasing disposable income of consumers and the growing consumer awareness are projected to enhance the growth of the agriculture robots market in the coming few years. As per the research study, the developed economies are likely to witness high growth, thanks to the rising use of technology for agriculture. 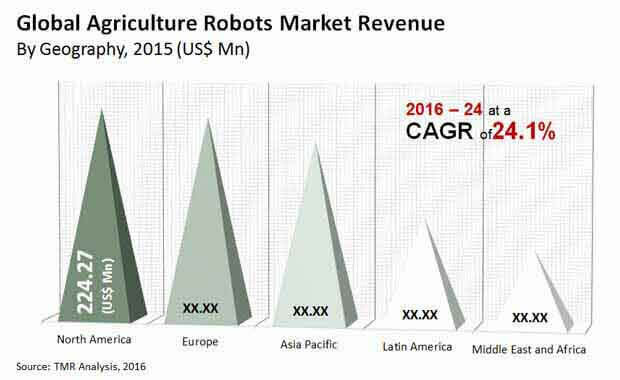 The global market for agriculture robots, on the other hand, is projected to face several challenges, which will result in restricting the overall growth of the market throughout the forecast period. The growing need for high capital investments and the lack of standardization and the safety concerns are estimated to hamper the development of the global agriculture robots market in the near future. In addition to this, the lack of technical awareness among farmers in the agriculture robotics technology is estimated to curb the growth of the market in the near future. Nevertheless, the key players in the market are focusing on commercialization of the agriculture robots, which is likely to attract consumers, thus accelerating the growth of the global agriculture robots market in the coming few years. The rising demand for food with the rising population around the world is expected to encourage the growth of the agriculture robots market in the next few years. Developing economies to hold immense growth opportunities for the market players, which will support the growth of the market in the near future.